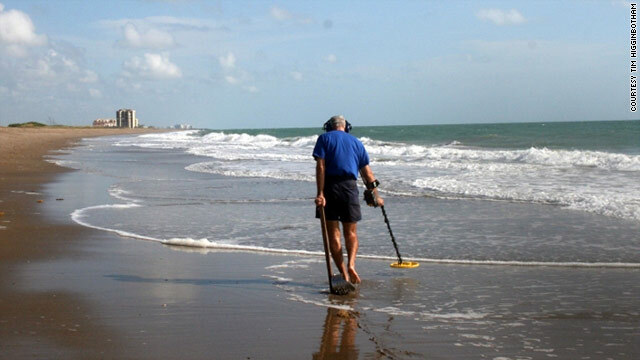 Tim Higginbotham scans a beach near Fort Pierce, Florida, with his metal detector. (CNN) -- Most people heading to the seashore bring along sunscreen, colorful towels and a big umbrella. For others, the ultimate beach accessory is a metal detector. You've probably seen them during your trips to any coast -- sweeping the gadget back and forth along the water, ears covered by big headphones, eyes scanning the sand -- and wondered what exactly they're looking for. Meet the detectorists, as the community of hobbyists is known. You'll return from a day at the beach with a tan and some pretty sea shells. They're hoping to bring back something more lucrative. Gold, anyone? This treasure hunt may evoke romantic images of shipwreck relics washing up ashore, and that does sometimes happen. But more often than not, the loot simply slips off the bodies of modern-day beachgoers. "If you have people who are swimming, you're going to have gold in the water," said Dan Berg, an avid detectorist and author of "Beach and Water Treasure Hunting with Metal Detectors." "The more swimmers there are, the more gold there's going to be." It's the perfect setup, when you think about it. Most vacationers cover themselves liberally with suntan lotion and bake under the sun, so their hands swell. Then, when they go to cool off in the water, their fingers shrink. And since they've already been "pre-lubricated" by the sunscreen, rings can slide right off, Berg said. Waves and currents help nudge accessories off, too. It's probably one of the only pastimes that pays for itself. The promise of such orphaned jewelry, or "drops," has always made beaches an alluring destination for detectorists, but the skyrocketing price of gold in recent years has more people than ever interested in the hobby. Want to get in on the action? There's real money at stake, so there is a sense of secrecy, caution and reluctance when you ask veteran detectorists for a lot of specifics. But most advise newbies to start with the big tourist beaches first to increase the odds of finding something valuable. Think Fort Lauderdale, Florida; Atlantic City, New Jersey; Myrtle Beach, South Carolina; Venice Beach, California, and the like. Then, there's Miami's South Beach. "That's a flashy place, and it also has a lot of people who like to party. They get out there with their bling and they turn cartwheels and get drunk and do all kinds of foolish things," said Tim Higginbotham, who has been beach metal detecting for 25 years. "Miami is an ideal place to come up with a Rolex watch or a good diamond ring or something like that. You can find a lot of stuff down there on South Beach." Veteran detectorists advise spending $200 to $500 for your first metal detector. A good one will "see" about a foot under the sand. Consider what kind of detector you want to use: There are machines for use on land only and machines that allow you to wade into the water. Going into the water can yield better results because there will be less junk than on a dry beach where people throw away bottle caps, etc., said veteran detectorist Dan Berg. Go early in the morning or late in the evening to avoid the crowds, said veteran detectorist Amy Maruso. Be prepared for a workout. Maruso's typical outing lasts five hours, which includes lots of walking and digging. Detecting after a storm that erodes the beach or moves the sand can boost your chances of finding something valuable. Have lots of patience. It takes time to learn where the good items are, so you'll probably find lots of trash at first, said veteran detectorist Tim Higginbotham. Going to any popular beach after a big holiday, like the Fourth of July, can also yield more finds because so many people flock to the shore to relax and celebrate, Higginbotham said. The detectorist has found his share of gold over the years, some of which he has sold and some of which he keeps in a safety deposit box. He mostly hunts along the beaches near his home in Fort Pierce, Florida, on the state's Treasure Coast -- so called because of the Spanish ships full of silver and gold that shipwrecked in the area almost 300 years ago. Here, relics sometimes do show up, including Higginbotham's favorite finds: a religious medallion from the Nieves, a sunken Spanish treasure galleon, and a 1714 gold coin. Be aware that you'll find lots of junk before you stumble onto anything valuable, warned Amy Maruso, who lives in suburban Philadelphia and likes to treasure hunt on the beaches of northern New Jersey. The hobby has consumed her for 30 years and she carefully studies winds, moon phases and tides to plan her outings for maximum payoff. Maruso recently cashed in some of the gold she's found for $1,300, she said. But she also doesn't scoff at loose change -- which can add up -- so she likes to go to any beach that has a boardwalk, where people are likely to carry a lot of coins for parking meters, amusement rides and food. The sight of detectorists scooping up change from the sand sometimes prompts laughs from other beach goers, Maruso said. Bud Light even made an ad mocking "Mr. Beach Metal Detector Guy" as part of its popular "Real Men of Genius" series. The hobby has an eccentric image, Maruso agreed. Her most memorable encounter while metal detecting on a beach took place with a homeless man who asked her for money. "He looked at my scoop and he said, 'Oh, never mind, I see you have to scrounge for change too,'" Maruso recalled with a chuckle. Her favorite find so far has been a "large cent" minted in the United States in 1794. The hobby can be so addictive that detectorists often pack their metal detectors whenever they travel to any destination with a beach. Berg has brought it to Bermuda and the Atlantis resort in the Bahamas. Higginbotham usually finds enough change to pay for some meals when he vacations in the Caribbean. "The beauty of metal detecting is that almost anybody can do it, and you can do it at different levels and intensities," Berg said. "It's probably one of the only pastimes that pays for itself." Interested in finding out more? The Internet offers lots of advice, including sites such as the Treasure Coast Beach Report and GoMetalDetecting.com. You can see what valuables others have found on forums, including TreasureNet.com and MyTreasureSpot.com. Metal detecting often isn't allowed on beaches that are state parks, so check out guidance from the Federation of Metal Detector and Archaeological Clubs. If you want to limit your searches to beaches near shipwrecks, there are online guides to sunken ships along the coasts of Florida; the Outer Banks of North Carolina (known as the "Graveyard of the Atlantic"); and New England.